A new article I co-authored has just been published to the International Review of Research in Online and Distance Learning (IRRODL). It is another output from a recent project at the University of Edinburgh exploring the geographies of distance in online programs (New Geographies of Learning) and is rather complementary to the article I mentioned in a previous post, exploring the social topologies of online students. This article was co-authored with two of my favorite people in all the world, Dr. Jen Ross and Dr. Hamish Macleod, both of the Moray House School of Education at the University of Edinburgh. IRRODL is one of my favorite publications and kudos to them for the variety of formats in which they make their articles available, including HTML, PDF, ePub, and MP3 formats. The MP3 format strikes me as a particularly good idea, not just for allowing the visually impaired to access these materials, but also to ease the strain on my eyes. I have played a few of these in the background (on my commute, etc.) and it is a surprisingly refreshing alternative to reading. I include the link to the MP3 of our article below in the citation. Practically, this article I suspect would be most useful for those engaged with or developing elearning programs. We evaluated the environments and motivations in which students engage with the program, provided a theoretical underpinning to how we can make sense of these perpetual comings and goings (towards and away from the program), and we finished with some practical considerations on how distance can be made visible. This is a critical consideration, I suspect. It is not enough to merely understand the processes taking place; it is important to theorize a mechanism for fleshing that all out to the surface. Once a student’s distance (or nearness) is visible, we can develop strategies to increase their resilience in these open online spaces. Recognise nearness as effortful. Nearness enacts a cost and requires an effort that may not always align with the expectations, motivations, and commitments of the student. Even when it does, it will not be an effort that can be maintained at the same level indefinitely. These misalignments and shifts of effort can be productive, if prospective and continuing students are helped with strategies for making the effort, and reassured that times of both nearness and greater distance are normal. This might prove to be a valuable part of pre-arrival and induction processes for online distance programmes, perhaps expressed through a series of narratives from other students about how they have navigated the formation of their own assemblages of nearness, coped with disruptions, and experienced periods of greater distance. New students might then prepare themselves for the effort involved not only in doing the work, but in making and sustaining connections and affinities, and recognise when this is and is not working well for them. Identify affinities. As we have seen, affinities can be personal, social, and structural. They will also be found both inside and outside the formalized aspects of the programme, and students might seek to build on the commitments that bridge their professional, personal, and academic worlds. Assessment practices that give students opportunities to articulate their positions and meaning-making in the context of programme content might make affinities visible. These practices might have reflective elements, or be based on topics that students select. Teachers might also suggest strategies for identifying affinities – ways of noticing where areas of excitement or preoccupation might indicate productive areas to focus on. Value perspective shifts. By viewing nearness as continually assembled, we open spaces for considering the value of the different perspectives that come at times of greater nearness and greater distance. One benefit of studying part-time is that there is more time for ideas to be cultivated, and for insights to emerge in unexpected ways. Where students are recording their developing ideas online (in discussion boards, blogs, wikis, and so on), traces of perspective are laid down and made visible. Teachers might use these traces in more deliberate ways, setting students occasional tasks of revisiting and examining an older perspective of their own, valuing the forgotten insight, the former preoccupation, a past configuration of knowledge that may spark new engagements. Design openings. Where students are in periods of greater distance, perhaps even alienation, returning can be challenging (as we saw Allie describe). Creating “openings”, or invitations, that normalise distance and acknowledge the challenges of reassembling nearness, might help students to find their way back “in”. These invitations might be personal and direct (a friendly email), or more diffuse (a programme space that is easy to check in to, such as a Twitter feed or a social hub). What we should be seeking to do, as teachers on online distance programmes, is to design opportunities for potential reconnection that students can build on when they need them. Such openings need not disappear after graduation either – they can continue to be part of the shifting relationships between programmes, teachers, and current and former students that an online distance programme makes particularly possible. If you think this isn’t a real concern or a pressing need, I urge you to reconsider. So much of our learning is now taking place online and so much of it will require a level of resilience (t0 wade through the mass of opportunity) that we don’t have much of a cultural precedent for. We need models to generate strategies and those models need to be theoretically sound, predictive of the phenomena taking place there. I think this paper goes a long way in doing that. It also goes a long way in humanizing the activity, rooting it firmly in the frame of the individual participant, in their hopes, desires, frustrations, and, hopefully, resilient success. Ross, J.; Gallagher, M.S. & Macleod, H. (2013). Making distance visible (PDF). International Review of Research in Online and Distance Learning (IRRODL), 14(4). MP3 Version. Online distance learners are in a particularly complex relationship with the educational institutions they belong to (Bayne, Gallagher, & Lamb, 2012). For part-time distance students, arrivals and departures can be multiple and invisible as students take courses, take breaks, move into independent study phases of a programme, find work or family commitments overtaking their study time, experience personal upheaval or loss, and find alignments between their professional and academic work. These comings and goings indicate a fluid and temporary assemblage of engagement, not a permanent or stable state of either “presence” or “distance”. 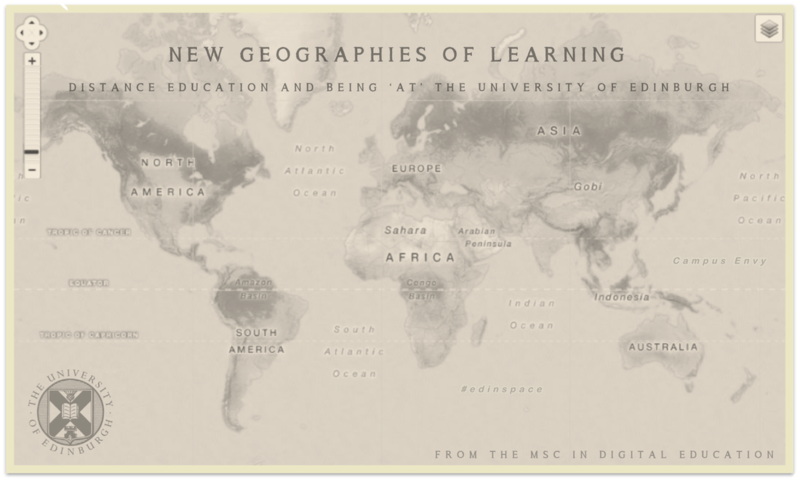 This paper draws from interview data from the “New Geographies of Learning” project, a research project exploring the notions of space and institution for the MSc in Digital Education at the University of Edinburgh, and from literature on distance learning and online community. The concept of nearness emerged from the data analyzing the comings and goings of students on a fully online programme. It proposes that “nearness” to a distance programme is a temporary assemblage of people, circumstances, and technologies. This state is difficult to establish and impossible to sustain in an uninterrupted way over the long period of time that many are engaged in part-time study. Interruptions and subsequent returns should therefore be seen as normal in the practice of studying as an online distance learner, and teachers and institutions should work to help students develop resilience in negotiating various states of nearness. Four strategies for increasing this resilience are proposed: recognising nearness as effortful; identifying affinities; valuing perspective shifts; and designing openings. Hamish was the reason I actually started (and eventually completed) the MSc in Digital Education at the University of Edinburgh (2009-2011). Oddly enough, I was attending eLearning Africa 2008, which was being held that year in Accra, Ghana. I was working with Aluka at the time. Hamish spoke about the program and I immediately applied. You never know how these online and physical realities are going to slam into one another to generate opportunity. Listening to Hamish speak was one of the most fortuitous events of my life, academic or otherwise. It opened so many opportunities, so much camaraderie, so much creative and intellectual stimulation. I highly doubt I would be doing a PhD now without that experience on the MSc at the University of Edinburgh.